Van Morisson’s Them hit rock on the head twenty years earlier – and looked way cooler doing it. Plus, there’s a donkey. Now do yourself the favor of listening to Patti Smith’s Gloria off 1975’s Horses, U2’s Gloria from their sophomore album, October (note Bono’s awesome 80s pompa-mullet). And if it’s raining where you are and you really want to embrace it, here’s Mineral’s. 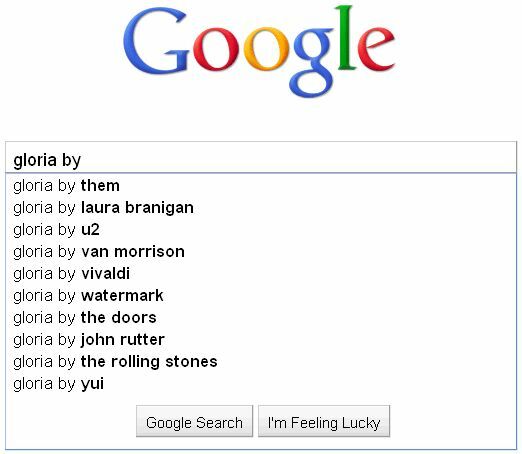 This entry was posted in Google Game and tagged gloria, google search, laura branigan, mineral, u2, videos. Bookmark the permalink.